The title of Don’t Breathe works twofold: the first is a tidy encapsulation of the premise, that of a few young burglars evading a blind, psychopathic army veteran in his own home; the second is a summation of the strategy of the filmmakers, which is to throttle the viewer to within an inch of their life. It is unsparing in its relentless assault on the viewer, only releasing the tension in the very last two minutes or so, relying almost solely on ratcheting the suspense up to almost impossible levels in order to create an atmosphere of constant dread. With a tight premise, a particularly nasty frame with nothing on its mind but violence, and strong filmmaking in his arsenal, Fede Alvarez crafts what can be described simply as a thrill ride. Don’t Breathe sums itself up in the opening shot, which oddly enough follows none of the aesthetic decisions that it follows for the rest of the film. It is a slow, meticulous zoom, moving from an aerial shot to a close-up of Rocky’s face as she is dragged through the streets by the Blind Man. The context only becomes clear late in the film, but the emphasis of the scene is on the visceral impact, the threat inherent in the abandoned neighborhood where the action of the film takes place. Afterwards, the introduction to the protagonists is simple but clean, unfussy in its portrayal of the trio of burglars and their motivations, especially for taking on such a dangerous job. 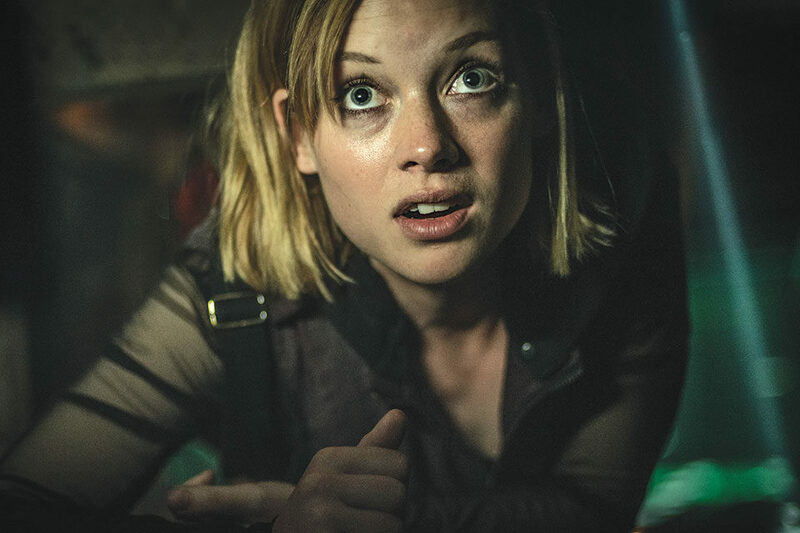 Once Don’t Breathe enters the claustrophobic house that defines almost all of its runtime, Alvarez efficiently introduces the two remaining components. First, the geography of the house itself; Alvarez uses a continuously roving Steadicam that does indeed make the ground and second floor as clearly mapped as possible, moving slowly up between floors and zooming down hallways. And second, the Blind Man in his natural habitat. Much of this is due to Lang’s fearsome performance, using his scarred face, his growling voice, and his hulking physicality to the maximum potential—his presence alone intimidates the intruders, and his brutal actions only heighten the danger. But what makes him so interesting is the signs of humanity (and thus weaknesses) that swirl beneath the gnarled surface: he falls asleep to home videos of his deceased daughter, his lack of sight isn’t fully compensated for by his other heightened senses, and he is prone to fits of rage that only give Rocky and her friends time to escape. Lang’s characterization may loom largest in memory, but it does not obscure the stellar work that adds up to the melting pot of tension that is Don’t Breathe. Jane Levy, as Rocky, is a match for the Blind Man, with an astonishingly tenacious outlook that balances with her sheer terror. Alvarez uses mostly tight close-ups on the terrified expressions of the burglars as the film goes on, and the sharply detailed sound design remains one of the greatest keys to the tension, but he breaks with the tight mapping of the first two floors when the movie descends into the depraved basement of the Blind Man. There are various deliberately queasy developments that take place down there, but more significant is the confusing layout, even before the lights are turned out. The film’s most heart-stopping scene takes place in a grey, night-vision-like haze, as the Blind Man’s knowledge of his house comes to the fore. Even after the daylight rises, Alvarez keeps the tension up until the last moment possible, a cathartic release that truly feels earned. Don’t Breathe aims squarely for the viewer’s primal fears, throwing them into the head space of the terrified subjects and sustaining tension so well that it required me to unknot myself after the film was over.